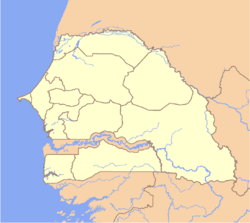 Saint-Louis, or Ndar as it is called in Wolof (the most widely spoken language in the West African nation of Senegal), is the capital of Senegal's Saint-Louis Region. Located in the northwest area of Senegal, near the mouth of the Senegal River, and 320 kilometers (199 mi) north of Senegal's capital city Dakar, it has a population officially estimated at 176,000 in 2005. 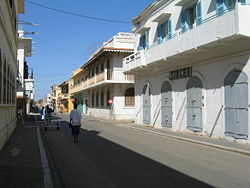 Founded in 1659, Saint-Louis was the capital of the French colony of Senegal until independence in 1960. From 1920 to 1957 it also served as capital of the neighboring French colony of Mauritania. After more than three centuries, Ndar enjoys a history and cultural background, visible through its architecture and other characteristics. The city serves as a bridge between savanna and desert, ocean and river, tradition and modernity, Islam and Christianity, Europe and Africa. Its distinctive colonial architecture is among the features that put the island on the list of UNESCO World Heritage Sites in 2000. Tourism makes up an important and integral part of Ndar's economy. Birds flock on the beach at the Langue de Barbarie National Park, 2006. The heart of the old colonial city is located on a narrow island slightly more than 2 kilometers (1 mi) long and about 400 meters (1,312 ft) wide) in the Senegal River, 25 kilometers (16 mi) from its mouth. At this point the river is separated from the Atlantic Ocean to the west by a narrow sand spit, the Langue de Barbarie 300 meters (984 ft) wide, which has also been urbanized (the seaside neighborhoods of Ndar Tout and Guet Ndar). Yet a third part of the city, Sor, lies on the eastern mainland and is nearly surrounded by tidal marshes. Ndar is situated on the Mauritanian border, though the border crossing is at Rosso, 100 kilometers (62 mi) upstream. Ndar only has two seasons, the rainy season from June to October, characterized by heat, humidity, and storms, and the dry season from November to May, characterized by cool ocean breezes and dust from the Harmattan winds. Three characteristics give Ndar its distinctive appearance: the Sahel, the marshes, and the Langue de Barbarie. Part of the Sahel, a transitional band of desert, Ndar’s landscape is characterized by occasional acacias and is disturbed by sand storms during the dry season. The marshes are flood basins that form during the rainy season when the river overflows into the countryside, creating ponds and stretches of mangroves that attract birds like flamingos and pelicans. The Langue de Barbarie is a 600 km long stretch of sand, from Nouadhibou in Mauritania to Ndar, that separates the Senegal River from the Atlantic Ocean. Its vegetation mainly consists of Filao trees (Casuarina equisetifolia), an evergreen tree native to Australasia, southeastern Asia, and islands of the western Pacific Ocean propagated in West Africa to prevent soil erosion in sandy and salty soils. French view of the fort at Saint-Louis island, 1814. Colonial Saint-Louis c. 1900: Europeans and Africans on the Rue Lebon. Faidherbe Bridge, the symbol of the city. Saint-Louis was established in 1659 by French traders on an uninhabited island called Ndar. It was named Saint-Louis-du-Fort in honor of French king Louis XIV and became the first permanent French settlement in Senegal. The fortified factory commanded trade along the Senegal River. Slaves, hides, beeswax, ambergris, and, later, gum arabic were exported. In the late eighteenth century, Saint-Louis had about 8,000 inhabitants, not counting an indeterminate number of slaves in transit. Between 1659 and 1779, nine chartered companies succeeded one another in administering Saint-Louis. A Franco-African Creole, or Métis, merchant community characterized by the famous signares, or bourgeois women entrepreneurs, grew up in Saint-Louis during the seventeenth and eighteenth centuries. The Métis were important to the economic, social, cultural, and political life of the city. They created a distinctive urban culture characterized by public displays of elegance, refined entertainment, and popular festivities. They controlled most of the up-country river trade and financed the principal Roman Catholic institutions. A Métis mayor was first designated by the governor in 1778. Civic franchise was further consolidated in 1872, when Saint-Louis became a French "commune." Louis Faidherbe, who became governor of the colony of Senegal in 1854, contributed greatly to the development and modernization of Saint-Louis. His large-scale projects included the building of bridges, provisioning of fresh drinking water, and the construction of an overland telegraph line to Dakar. Saint-Louis became capital of the federation of French West African colonies in 1895, but relinquished this role to Dakar in 1902. During this period Saint-Louis became the leading urban center in sub-Saharan Africa, as well as the center for the diffusion of cultural and artistic activities. Saint-Louis’ fortunes began to wane as those of Dakar waxed. Access to its port became increasingly awkward in the age of the steamship, and completion of the Dakar-Saint Louis railroad in 1885 meant that up-country trade effectively circumvented its port. Large French firms, many from the city of Bordeaux, took over the new commercial networks of the interior, marginalizing the Métis traders. Saint-Louis maintained its status as capital of the colony of Senegal even after Dakar assumed the role of capital of the French West Africa federation. The colonial institutions set up in the city in the nineteenth century, such as the Muslim Tribunal and the School for Chiefs’ Sons, were to play important roles in the history of French Africa. Though relatively small in size (population of 10,000 in 1826; 23,000 in 1914, and 39,000 in 1955) Saint-Louis dominated Senegalese politics throughout the nineteenth and early twentieth centuries, not least because of its numerous political parties and associations and its independent newspapers. Following independence, when Dakar became capital of the new country, Saint-Louis slipped into a state of lethargy. As its French population and military departed, many of the town’s shops, offices, and businesses closed. This resulted in a loss of jobs, less investment, and an economic decline. For some people, however, Saint-Louis' decline was not just limited to its economy, but spread to all aspects of its life as the loss of its past status meant less recognition and lack of interest from the colony’s officials and, after Senegal’s independence, from the Senegalese government. When its most famous political son, the French-educated lawyer Lamine Guèye, died in 1968, the city lost its strongest proponent. Home to a society with a distinctive lifestyle, Saint-Louis has retained its unique identity. "No one comes without falling in love with the city," proudly say its people, who consider Saint-Louis the birthplace of Senegalese teranga, the Wolof word for "hospitability." Pirogues, many painted with names of Sufi leaders, jam the Saint-Louis wharf. They are used for fishing, transport, and tourism. Colonial architecture lines the streets of the old city. Though no longer the capital, Saint-Louis has remained an important tourist and trading center. and the city's economy is gradually reviving. Tourism constitutes an important part of Ndar's economy, thanks to its distinctive appearance, numerous sites of attraction, and international music festivals and cultural exhibitions. Ndar remains one of the most characteristically French colonial destinations in West Africa, along with Gorée Island near Dakar, attracting more than 10,000 foreign tourists every year. Among Ndar’s numerous natural sites are the National Park of the Langue de Barbarie, the National Park of the Birds of Djoudj, the Fauna Reserve of Gueumbeul, beaches like that of the Langue de Barbarie, the colonial waterworks at Makhana, the palace of Baron Roger at Richard-Toll, the Maka-Diama dam, and various hunting lodges on the south side of the Senegal River. The National Park of the Langue de Barbarie occupies the southern point of the Langue de Barbarie, the estuary of the Senegal river and part of the continent. It hosts thousands of water birds, such as cormorants, brushes, pink flamingos, pelicans, herons, and ducks each year. The world’s third ornithological park, the National Park of the Birds of Djoudj is located 60 kilometers north of Ndar. This park occupies over 120 square kilometers and includes part of the river, as well as lakes, basins, and marshes. About three million migrating birds of 400 species visit it each year. Located south of the city of Ndar, the Fauna Reserve of Gueumbeul shelters birds and endangered species such as the Dama Gazelle, the Patas monkey, and the African Spurred Tortoise. Ndar is famous for its urban culture. The heritage of the signares lives on in the city’s many festivals and its cultivated sense of public display, helping Ndar emerge from decades of neglect. "Fanals," which are nighttime processions of giant paper lanterns, take place at Christmas time. The Saint-Louis Jazz Festival is the most important jazz festival in Africa. Jazz first became popular in the 1930s when records produced in Cuba were aired on the radio. After World War II, visiting American troops popularized jazz bands, and by the 1950s local groups had adopted a "Cuban" sound. Another music festival, 1, 2, 3 musiques, exhibits various genres. The annual reggata, or pirogue race, organized by teams of fishermen from Guet-Ndar, takes place on the "little branch" of the river, between Ndar Island and the Langue de Barbarie. The Magal of the Niari Rakas, a yearly commemoration of Cheikh Ahmadou Bamba Mbacké’s (the founder of Mouridism) two prayers in the Governor's Palace in 1895, is the city's largest religious gathering. Ndar’s museum offers panoramas of Senegal’s history, such as exhibitions of traditional clothes and musical instruments. Other attractions are the Governor’s Palace, the Parc Faidherbe (named for the French governor) at the center of town, colonial-era hotels, the Grande Mosquée, the Faidherbe Bridge that connects the island to the Langue de Barbarie, and the Gaol and Servatius bridges that connect the island to the continent. The main tower at University Gaston Berger, 2007. Beyond tourism, Ndar is also a commercial and industrial center for sugar production. Its other economic activities are fishing, irrigated alluvial agriculture, pastoral farming, trading and exportation of peanut skins. Each of these economic activities is pursued by a particular ethnic group. The Wolofs and Lebous, who are the main inhabitants of Ndar, are mostly fishermen who live in communities like Guet-Ndar on the Langue de Barbarie. The Peulhs live inland and practice pastoral farming. The Maures, who are migrants from Mauritania, are mostly merchants, traders, and shopkeepers and are found everywhere in Saint Louis. Criterion II The historic town of Saint-Louis exhibits an important exchange of values and influences on the development of education and culture, architecture, craftsmanship, and services in a large part of West Africa. Criterion iv The Island of Saint-Louis, a former capital of West Africa, is an outstanding example of a colonial city, characterized by its particular natural setting, and it illustrates the development of colonial government in this region. With a large influence over education in colonial times, Ndar is today the home of the University Gaston Berger and the Military Academy Charles Ntchorere. 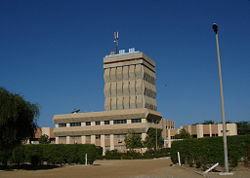 The university, created in 1990, offers studies in a number of general education and research faculties. The Military Academy Charles Ntchorere, commonly known as the Prytanee Militaire of Saint-Louis, was created in 1922. The school’s mission today is to provide pupils from various African countries not only with a secondary education but also a moral formation on the principles of patriotism, honor, and discipline. Ndar played an important role in the whole of West Africa during its colonial days. It was essential in the development of the region's education, culture, architecture, craftsmanship, economy and services. Its island location at the mouth of the Senegal River, its system of quays, and the characteristic colonial architecture gave the city a refined identity and made it a popular vacation destination. The old section of the city retained its charm and conserved its historic fabric until the mid-twentieth century when Senegal's capital city was transferred to Dakar. Since that time, not only have the historic buildings lost their luster, but the city as a whole, and its population, have suffered decline. It is now principally a fishing center and a river-rail transfer point for the trade of the Senegal valley. In addition to the decline of its economy and status that followed the move of the capital, many of Ndar's youth are moving away, most headed for the capital city. However, the city continues to attract more than 10,000 foreign tourists every year. Its reputation as West Africa's jewel during its heyday remains. It is known as a beautiful and colorful city at the meeting point of the river and the sea. While decades of decline threatened its architectural charm, its listing in 2000 as a UNESCO World Heritage Site has brought a means of preservation. Cultural tourism has become an engine of growth. As a result, a process of gentrification has set in, with many historic buildings on the island being turned into restaurants and hotels. Unfortunately, rising sea levels, as well as higher water levels flowing out of the Senegal River, now threaten the low-lying islands that make up the city. In June 2008, Alioune Badiane of the United Nations' habitat agency designated Ndar as "the city most threatened by rising sea levels in the whole of Africa," citing climate change and a failed 2004 river and tidal canal project as the cause. ↑ UNESCO World Heritage Centre, Island of Saint-Louis. Retrieved January 16, 2009. 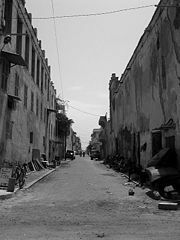 ↑ Tidiane Sy, May 13, 2005, Senegal's decaying city of charm, BBC News. Retrieved January 16, 2009. ↑ BBC News, June 13, 2008, Senegal city is "most threatened." Retrieved January 16, 2009. Coats, Geoffrey. 1997. "From Whence We Come: Alioune Diop and Saint-Louis, Senegal." Research in African Literatures. 28 (4): 206. OCLC 88775322. Diop, Ahmadou Fatim. 1990. Saint-Louis. Dakar: Librerie-papeterie Wakhatilene. OCLC 76751006. Sy, Tidiane. May 13, 2005. Senegal's decaying city of charm. BBC News. Retrieved January 16, 2009. UNESCO World Heritage Centre. Island of Saint-Louis. Retrieved January 16, 2009. All links retrieved August 4, 2015.
saintlouisdusenegal.com: "Le portail touristique et culturel de Saint-Louis du Senegal." Saint-Louis news and culture portal. French Language Site. This page was last modified on 4 August 2015, at 14:51.